This week's second recipe is Instant Amla Pickle. Traditional preparation of pickle uses more oil and salt for longer shelf life of the pickle. In a healthy point of view, we don't prefer salty and oily pickle in our meal as we include pickle every weekend and sometimes during weekdays for parathas. because of it, We prepare instant one frequently in smaller quantity with less oil and salt. Since the baseline preparation for all almost the pickles is same, I do change only the main ingredient for different type of pickles. Here, I used amla as main ingredient and boiled it to get instant softness. You can boil it with water or steam it till they become soft. As I said before, I used less oil and salt. If you don't want to sacrifice the authentic look and taste of it, add more oil and salt. 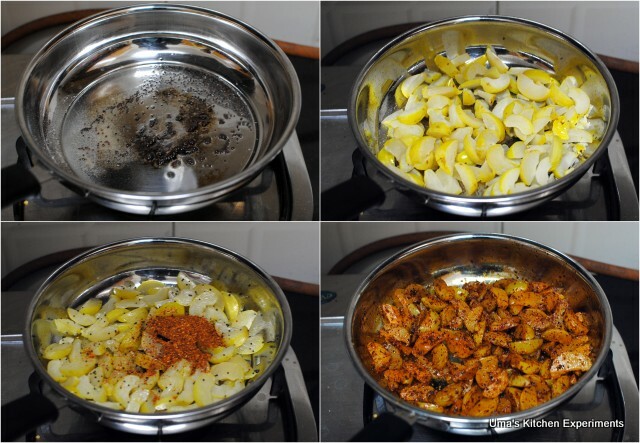 1) Heat water along with a pinch of salt and turmeric in a sauce pan. When it is boiling, add amla slowly. Let it be in rolling boil for 5 minutes. Turn the flame off. Drain the water and allow the amla to cool. 2) Meanwhile, dry roast red chilli and fenugreek seeds. Make a powder of it. Keep it aside. 3) Now, Cut into wedges once the amla reaches to room temperature. 4) Heat a pan with a tablespoon of oil. When it is hot,add asafoetida and mustard seeds. Allow it to splutter. 5) Add amla wedges. Mix well. Let it cook for 3-5 minutes in low flame. 6) Add powder of dry red chilli and fenugreek seeds that we prepared already. Add turmeric and salt. Remember, we added salt to the amla while boiling(in first step). So, add salt accordingly. Mix well. 7) Cook for 2-3 minutes and turn the flame off. 8) Cool to room temperature and store in a dry container. Keep refrigerated for longer shelf life. Loving this instant version! lovely pics..
Slurp, tongue tickling pickle..drooling here. At the end of the post my mouth was watering. Looks delicious. I also make it the same way super! Love this instant method to have a fresh pickle..
liked this instant version.... will try this. Instant version is good for such a busy lifestyle..will try soon..
i like this method uma... instant way is always the best.. I love amla pickle . Instant one is so good! Finger licking good..love gooseberry pickle. Very flavorful and tangy pickle, mouthwatering here. Hi Uma, found this recipe so simple and the pictures so tempting, that I decided to try it out right away. It has turned out really well. Just that I allowed the amlas to cook in oil for almost an hr on low flame to increase its shelf life! Hi Anonymous, yes, you can.